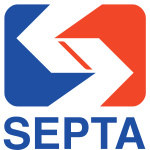 The Southeastern Pennsylvania Transportation Authority (SEPTA) is an agency that is in control of many types of transport, including buses, commuter rail, elevated rail and subways. It operates 13 "Regional Rail" services in the Philadelphia, Pennsylvania area. Geographically-accurate SEPTA rail transit map. Includes Regional Rail, rapid transit, and trolley lines. Also includes connecting services. ↑ "2007 Governments Integrated Directory (GID)" (database). Census of Governments. U.S. Census Bureau, Governments Division. 2007. Retrieved 2009-11-08. ↑ "SEPTA Facts". SEPTA Web site.